Simply put, it’s a way to extract energy from running water! Hydropower or “water power” is power derived from the energy of falling water or fast running water, which may be harnessed for useful purposes. Since ancient times, hydropower from many kinds of watermills has been used as a renewable energy source for irrigation and the operation of various mechanical devices, such as gristmills, sawmills, textile mills, trip hammers, dock cranes, domestic lifts, and ore mills. In the late 19th century, hydropower became a source for generating electricity and the first commercial hydroelectric power plant was built at Niagara Falls in 1879! 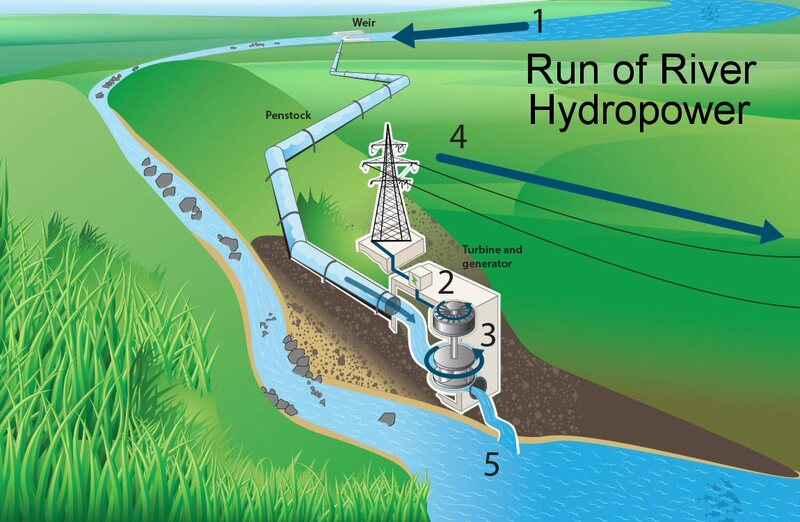 A common method to produce hydropower is “run of river”. Run of river “ROR” hydropower is a type of hydroelectric generation plant whereby some of a river’s flow is diverted through a pipe or tunnel leading to electricity-generating turbines, the water is then returned back to the river downstream. ROR power plants may operate with a limited amount of storage, in which case the storage reservoir is referred to as “pondage“. A project with pondage can regulate the water flow at all times and can store water for daily load demands. ROR hydropower is considered ideal for streams or rivers that can sustain a minimum flow or those regulated by a lake or reservoir upstream. A small dam is usually built to create a headpond ensuring that there is enough water entering the penstock pipes that lead to the turbines which are at a lower elevation. In such stations, the normal course of the river is not materially altered. ROR projects are dramatically different in design and appearance from conventional hydroelectric projects. Traditional hydro dams store enormous quantities of water in reservoirs, sometimes flooding large tracts of land. In contrast, run-of-river projects do not have most of the disadvantages associated with dams and reservoirs, which is why they are often considered environmentally friendly. When developed with care to footprint, size, and location, ROR hydro projects can create sustainable energy minimizing impacts to the surrounding environment and nearby communities. Substantial flooding of the upper part of the river is not required for run of river projects, as a large reservoir is not required. As a result, people living at or near the river don’t need to be relocated and natural habitats and productive farmlands are not wiped out. Run of river hydropower diverts some of a river’s flow through to electricity-generating turbines, the water is then returned back to the river downstream. Electricity generated by the turbines can be consumed immediaitely, sent to a grid, or stored for later consumption. You can review the graphic below for an overview of how the process works (click to enlarge). 1. Water is diverted from a river or loch into a new channel. 2. The flowing water is passed through turbines. 3. The turbines turn the generator to produce electricity. 4. The electricity is used and the excess returned to the grid. 5. Water is returned to the river downstream. A water turbine is a rotary machine that converts kinetic and potential energy of water into mechanical work. Water turbines were developed in the 19th century and were widely used for industrial power prior to electrical grids. Now they are mostly used for electric power generation. 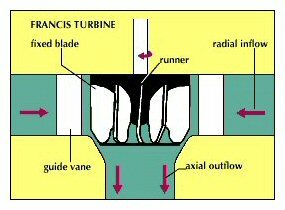 The Francis Turbine is an inward-flow reaction turbine that combines radial and axial flow concepts. Francis turbines are the most common water turbine in use today and are primarily used for electrical power production. The electric generators which most often use this type of turbine have a power output which generally ranges just a few kilowatts up to 800 MW, though mini-hydro installations may be lower. Wicket gates, around the outside of the turbine’s rotating runner, control the rate of water flow through the turbine for different power production rates. The water comes to the turbine under pressure and the energy is extracted by the turbine blades from the moving water. At the exit, water acts on the spinning cup-shaped runner features, leaving at low velocity and low swirl with very little kinetic or potential energy left. The turbine’s exit tube is shaped to help decelerate the water flow and recover the pressure. Francis turbines are individually designed for each site to operate with the given water supply and water head at the highest possible efficiency, typically over 90%. The Kaplan Turbine is a propeller-type water turbine which has adjustable blades. It combines automatically adjusted propeller blades with automatically adjusted wicket gates to achieve efficiency over a wide range of flow and water level. 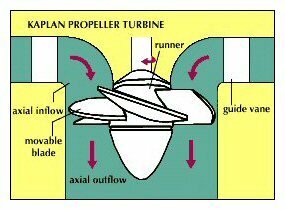 The Kaplan turbine was an evolution of the Francis turbine. Its invention allowed efficient power production in low-head applications that were not possible with Francis turbines. The output ranges from 5 to 200 MW. The turbines rotate at a constant rate, which varies from facility to facility. Kaplan turbines are now widely used throughout the world in high-flow, low-head power production. The Kaplan turbine is an outward flow reaction turbine, which means that the water changes pressure as it moves through the turbine and gives up its energy. Power is recovered from both the hydrostatic head and from the kinetic energy of the flowing water. The design combines features of radial and axial turbines. The inlet is a scroll-shaped tube that wraps around the turbine’s wicket gate. Water is directed tangentially through the wicket gate and spirals on to a propeller shaped runner, causing it to spin. The outlet is a specially shaped draft tube that helps decelerate the water and recover kinetic energy. Kaplan turbine efficiencies are typically over 90%, but may be lower in very low head applications.